Translated by Jovana Milutinovich from Geeks Education. This is a tutorial (previously known as “Some hints for the R beginner”) for beginning to learn the R programming language. It is a tree of pages — move through the pages in whatever way best suits your style of learning. You are probably impatient to learn R — most people are. That’s fine. But note that trying to skim past the basics that are presented here will almost surely take longer in the end. This page has several sections, they can be put into the four categories: General, Objects, Actions, Help. The primary purpose of this tutorial is — in the first few days of your contact with R — to help you become as comfortable with R as possible. The biggest stumbling block was thinking that R is hard. On reflection perhaps I shouldn’t have been so surprised by that answer. The vastness of the functionality of R can be quite intimidating (even to those of us who have been around it for years), but doing a single task in R is a logical and often simple process. So hint number one when beginning R seems to be to ignore your fear. More R introduction (including installation). R is mainly used as an interactive program — you give R a command and it responds to that command. The result may influence the next command that you give R.
The first item on the search list is the “global environment”. This is your work space where the objects that you create during the R session will be. If you do save the global environment, then you can start another R session with those objects in the global environment at the start of the new session. You are saving the objects in the global environment, you are not saving the session. In particular, you are not saving the search list. More R startup (including platform specifics). So you have successfully started R on your machine. Here’s where the trouble sometimes starts — there’s a big, huge prompt daring you to do something. You don’t need a mirror to know that you have that deer-in-the-headlights look on your face. The solution is, first, to have something to do, and then to break that task into steps. More R blank screen syndrome. An important strength of R is that it is very rich in the types of objects that it supports. That strength is rather a disadvantage when you are first learning R.
But to start, you only need to get your head around a few types of objects. The thing to remember about atomic vectors is that all of the elements in them are only of one type. There can not be an atomic vector that has both numbers and character strings, for instance. Lists can have different types of items in different components. A component of a list is allowed to be another list as well as an atomic vector (and other things). The final object in the list above is NULL. This is an object that has zero length. Virtually all of the other objects that you deal with will have length greater than zero. There are three important types of what might be called derived — or non-basic — objects. Matrices and data frames are both rectangular data objects. The difference between them is that everything in a matrix has to be of the same atomic type, but data frames can have different types in different columns. Each column of a data frame has to be of a single type. A matrix can look exactly like a data frame, but they are implemented entirely differently. Sometimes it doesn’t matter whether you have a matrix or a data frame. Other times it is very important to know which you have. Factors are often easily confused with character vectors. In particular, columns of data frames that you might think of as character are many times actually factors. Sometimes it doesn’t matter whether you have a factor or a character vector. Other times it is very important to know which you have. Three basic actions in R are assignment, subscripting and random generation. Once you have executed one of those commands, then meanx will be an object in your global environment. There is a shocking amount of controversy over which form of assignment to use. The position I’ll take here is to say to use whichever one you are more comfortable with. There are ways of running into trouble with either one, but using the arrow surrounded by spaces is probably the safest approach by a slight margin. Note that R is case-sensitive. The two names meanx and Meanx are different. extracts the first element from x.
extracts the element in the first row and third column of a matrix or data frame. will change the first element of x to 9.
creates a vector of 9 numbers that are uniformly distributed between 0 and 1. You will get different answers from this command if you do it again. The creation of a plot is another thing that can be done. This is discussed later in the Graphics section. Transferring data from one place to another is always fraught with danger. Expecting it to always be smooth is just setting yourself up for disappointment. But sometimes getting data into R does go smoothly. If you are trying to get rectangular data (something that looks like a matrix or a data frame) into R, then the read.table function or one of its relatives will be what you want to use. This function returns a data frame. Note: a data frame, not a matrix. There are also functions to read in more arbitrary data. makes R just give you a prompt. You might want to either save an object to use again in R, or create a file containing the data of the object to use in some other program. This will make the object(s) in the file (x in this case) available in the new session. See Graphics for saving graphics. Sometime, probably soon, you are going to get an error in R.
Hint: the universe doesn’t collapse into a singularity just because of an error in R. Actually, it builds character — see Make mistakes on purpose. R produces errors and warnings. Both errors and warnings write a message — the difference is that errors halt the execution of the command but warnings do not. We’ll categorize errors into three types: syntax errors, object-not-found errors, and all the rest. If you get a syntax error, then you’ve entered a command that R can’t understand. Generally the error message is pretty good about pointing to the approximate point in the command where the error is. Common syntax mistakes are missing commas, unmatched parentheses, and the wrong type of closing brace [for example, an opening square bracket but a closing parenthesis). There are endless other ways of getting an error. Hence some detective work is generally necessary — think of it as a crossword puzzle that needs solving. whenever you get an error. The results might not mean much to you at the moment, but they will at some point. The traceback tells you what functions were in effect at the time of the error. This can give you a hint of what is going wrong. A warning is not as serious as an error in that the command runs to completion. But that can mean that ignoring a warning can be very, very serious if it is suggesting to you that the answer you got was bogus. It is good policy to understand warning messages to see if they indicate a real problem or not. More R errors and such. In order to have a picture, you need a canvas for it to be on. In R such a canvas is called a “graphics device”. If you are just making graphs interactively, you don’t need to worry about graphics devices — R will start a default device for you. If you want to save graphs to share, then you will need to decide on a graphics device. will work. It might not be the picture that you most want to see, but often it does something at least semi-sensible. adds a line of slope 1 and intercept 0 to the current plot (but, depending on the plot, it might not be visible). Objects that have a “class” are the magic ones. Functions that are “generic” are magic functions. When you use a generic function, it looks for the class of its argument. What actual action happens depends on the class. Two functions mentioned above are generic: print and plot. Data frames and factors are each printed in their own special way because print is generic, and data frames and factors each have a class. The good thing about print being generic is that you see the important aspects of the object. The bad thing about print being generic is that you can easily think that you are seeing the real object. In reality you are just seeing the self-portrait of the object that it wants you to see. R is a vector language. An object is unlikely to be just one number or character string or logical value. More likely there will be multiple values in the object — sometimes dozens, sometimes millions. adds 2 to each value in x. It doesn’t matter if there is one value in x or two thousand. Make mistakes using R. That is, experiment. That’s what the pros do. You learn how things work (often reasonably efficiently). You learn to maintain your equilibrium when something goes wrong. More R mistakes on purpose. R does not pay any attention to the extensions on file names. However, there are conventions that make things easier for us humans. The .R files can also be created inside R by the dump function. Files called .RData are the same as .rda files. Some files that would logically be .R files actually have a .q extension — another long story. ESS (see More R computing environment ) creates .rt files for “R Transcript”. The side effect of this command is to show you the help file. The first point about help files is that they are not novels. You shouldn’t feel compelled to read them from start to finish. It may not be wise to expect yourself to understand everything before you use the function. Try it out, see if it looks like it will be useful to you, only then should you invest a lot of time understanding the details. A few packages are attached when R starts up. You can attach more into a session. There are several recommended packages that come with R but are not typically attached automatically. This command shows a list of the packages on your machine (in a standard place). There is a very large number of packages scattered around the internet. Most notably there is CRAN — the main repository of contributed R packages. (The command above only works if your machine has access to the internet.) You only need to install a package once. You need to do the require command for a package in each session you want to use it. Something that you might do a lot is search for how to do some particular task in R. Beginners are not alone in this. Experienced users have to search as well — R is a living, growing being. You can leverage your knowledge of other languages and programs to help you learn R. But there typically are pitfalls. There can be differences, sometimes subtle, that lead you down the wrong path. R should not be an island. Your use of R will be part of a larger task. People have found that having an editor that is aware of R smooths the full task considerably. There are numerous additional places where you can learn about R. Your skills with searching will help you find them. Here are a select few. An absolutely fun site is Try R at Code School. A few additional suggestions are in Some hints for the R beginner. An Introduction to R ships with R. If you are absolutely fresh, then this is not the book for you, but have a look. If you are considering buying a book on R, the best one to get depends on your background and what you want to do with R. There are a number of choices, that number is continually growing. However, there is one introductory book that I think stands out from the rest. 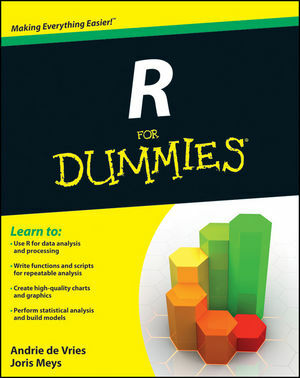 It is R for Dummies — the publisher page. The R-help mailing list is a source of information and help (as the name says). Reading (some of) R-help is going to be educational. Writing a message to R-help should be a last resort. If you do write a message and you don’t follow the rules, you should expect a rough ride. An alternative to the mailing list is the R tag of StackOverflow. R beginner, R newbie, R noobie, R novice, R neophyte — whatever label you like — the aim of this guide is to help get you from there to R user as quickly and painlessly as possible. 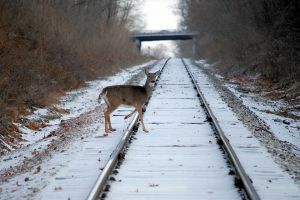 The deer picture is from natefischer via stock.xchng.